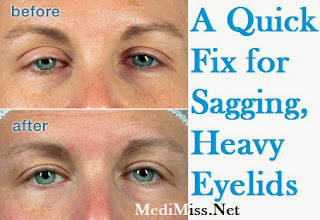 Droopy eyelids are a sure sign that Mother Nature has arrived to make your face look old. You know the look and the feel of heavy lids - they seem to have a mind of their own. You constantly lift your forehead when you are speaking and your eyes may begin to feel a tiredness that just doesn't go away. Not only are your eyes bothering you, those forehead wrinkles may have you thinking that a paralyzing injection might be required or even more drastic measures such as surgery may be needed. The medical community wants you to believe that you need to consider this route to look younger but in reality – this is not a fact! The upper eye lids, the brow and upper forehead are connected under the skin with muscles that weave over and under each other. The actual forehead muscle is vertical and it originates in the hairline. Usually by age 40, gravity has affected the forehead resulting in poor muscle tone and its downward slide pushes into the eyebrow muscles which then affects the upper eye lid and creates crow's feet. This downward movement of loose skin can impair one's vision if the lid puddles onto the eyelashes. There are only a few options available to enjoy younger looking eyes. Blepharoplasty is a surgical procedure to correct sagging upper and lower eyes. The upper eye procedure involves actually cutting the eyelids, removing excess tissue and then suturing the eyelids usually in the existing crease. The surgery is performed while the patient is under general anesthesia although there are other types of local and oral anesthesia's available; the procedure takes about 2 hours to complete and just like any other invasive procedure there are risks to consider. Electro-stimulation devices, using minute electrical currents, claim they can lift eyelids and brows. According to some well-paid physicians they do work but there is a healthy amount of skepticism from their peers. Overuse can cause spasms, headache, irritation, redness and burning. Electro-stimulation is very time consuming as each area requires about three minutes to treat so it's not unusual to spend an hour or more trying to lift your face every other day. The above mentioned options are not only costly; they're very temporary. Yes, temporary! Surgery does not correct poor muscle tone and neither do injections or electro-currents. Facial exercise is the smartest thing you can do to stop the cause of aging in your face but not all facial exercise programs work. Why? Because scrunching and contortions are not exercises!!! When there is no resistance or anchoring to create a contraction, your face cannot lift or look younger. Genuine facial exercise is not about scrunching or making contortions, rather, they are bone fide, precise movements that treat the cause of aging in your face. How long until you see results? Well, most people see results immediately and you should know that it takes about three to four weeks to see permanent results. Permanent results occur when the muscles are sufficiently strengthened to retain their new positions. If you do not regularly exercise the muscles in the face, you will look older. Our entire body needs exercise, and that includes our faces and necks. From head to toe, you can look healthier and vibrant without ever thinking about surgery, injections or electricity. Exercising your face requires only minutes per day and in less time than it took for your morning shower, you can have a face that looks 10-15 years younger.